Legacy – folded and tucked away | My last page scribbles! It was the queer, disapproving look in grandma’s eyes that perplexed each of us in her room that evening. “Why is she being so adamant? After all, it’s for her own comfort”- mutterings in tones of various kind were heard everywhere and amidst all of those sat my grandma with that unusually stubborn face. Her doctor had advised her to go for a loose rob instead of her regular “chatta and mundu” and it was this simple matter that has let out an air of tension all around. For a generation that has never used this traditional Malabari Christian attire, change was an easy word. But for a lady who had never even tried a different dress other than the “chatta and mundu” for more than 85 years, things were very much different. For generations, “chatta and mundu” was not just attire; but a noble representation of Malabari Catholic tradition (called as “Nasrani“traditions locally). Every girl born in this class wore this dress everywhere, for a life time. Leaving no scope for any additional decorations or color experiments, I have always wondered, how they have managed to embrace this white attire the entire life. The “chatta”, which forms the top part of the apparel is a white, modified version of a ladies’ blouse. With loose half sleeves, chatta has a small V-shaped neck.”Mundu”, on the other hand is an ordinary piece of cloth meant to simply wrap around the lower part of the body. But what would attract anyone’s eye is the fan like frill (called as “njori”) that is half spread out at the back. A 3rd piece of long cloth called as “kavani” or “nadan” would be worn around this mundu-chatta combination. A brooch would be pinned onto this kavani adding to its ornamental value. My maternal grandma had a great fascination for this brooch that she used to collect it in varying design and fashion. When and where did this traditional attire originate? ?I asked my grandma. She has no answer. She has seen her mother, grandmas, aunts, neighborhood ladies all wearing it. She remembers lining up for the margam kali (A traditional Malabari Christian dance commemorating the arrival of Saint Thomas) in chatta and mundu. She even showed me an old marriage photo of hers, wearing a fashionable chatta with a puffed sleeves. I can still remember that extraordinary glow in her eyes as she was trying to show me that chatta’s golden bead works in that black and white photo. Things have changed…And so has time. With convenience, fashion, trend, western influence all taking the lead roles, chatta and mundu has hardly any takers today. From a generation of Malabari Christian ladies that has worn only this attire, the number has shrunken to 6 old grannies in my parish, all above 80, wearing this traditional attire. Very few ladies in my mother’s generation have managed to at least try it once or twice where for my generation it’s completely a no-no. As a kid, I have heard my father saying about making my mother wear chatta and mundu for their 25th wedding anniversary. Interestingly, now that this is to happen in another 3 years time, disapproving tones are heard from my mother’s side. Destined to live in a world that adores changes, people like my grandma fascinate me. Grains of sand become lifeless in their hourglass.. People come and go, Seasons vary; yet these people remain the same. Blind they are to the changes around as the world calls them “slaves of habit”. Out there, after all that vain attempts to convince my grandma, the crowd has slowly disappeared. Standing all alone near that window, she smiles. Perhaps, it’s that window that let her see the changes around. Perhaps, it’s that window that hides the changes from her eyes. Good one! Loved the title most!! A great thought. And well written. Just like a neat ‘Njori’. Made for a good read. I think the old rather prize their bond with the familiar, don’t you think? very true Rithika.Perhaps we need to learn a lesson or two from them. Thanks for stopping by..I must say, you have a great blog too. Habits.. become tradition.. become a way of life. How true! and saddest part is that we pay little attention to preserve it. Glad that you stopped by Mr.Catsoe. Thank you friend! Even more eager to ponder the treasures hidden in the illusive road ahead! Haha thank you… I hope to give more regular posts! Thanks a ton Subha!! i’m definitely gonna give it an trial on your Spinach Chicken Soup!!! Well I’ll be honored if u do!!!! Let me know how it turned out!!! Somewhere at an unknown border between day and light, hope and despair, love and life; my journey begins. The road ahead might be wild and chaotic. The silence of the night or its immortal darkness doesn't bewilder me! I'm on an exploration to find the simplest things that define life; and paradoxically the hardest. Mindless laughter, little streaks of happiness and boundless love is all what I seek for!! 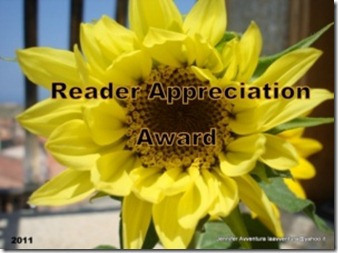 Reader Appreciation Award!! The Resonner way!! Your NAME does it all! !